Rules and details to enter below on Rafflecopter or click here. FTC: Items shown in this video/post were sent to me for review purposes but I will be providing the giveaway. All opinions are my own and 100% honest. This is NOT a sponsored video/post. 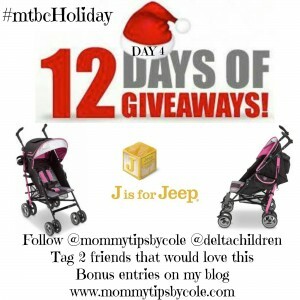 12 Responses to "J is for Jeep Stroller | 12 DAYS OF GIVEAWAYS: Day 4 | #mtbcHoliday"
This looks like a great umbrella stroller. Thank you for hosting these great giveaways!!! We would love the Jeep stroller!! Such a great brand and we need durability with four kids!! Love seeing your videos, this looks like an awesome stroller. What a great giveaway. I’d love to win. Would love a new stroller since my boys are getting to heavy with the double we have! I love the color of this stroller. This looks like a really nice lightweight stroller! Perfect for my granddaughter to use! Looks like a practical stroller! Love the colors too! I’m crossing my fingers! Oh my, how nice. I would love this for my daughter in law, she’s expecting a girl in Feb and doesn’t have a stroller yet!